The global riot control system market is projected to grow from USD 9.05 Billion in 2016 to USD 11.78 Billion by 2021, at a CAGR of 5.4% during the period. This report forecasts the riot control system market and its dynamics over the next five years, while also recognizing market application gaps, evolving technologies, recent developments in the market, and high potential geographic regions and countries. The riot control system market has been analyzed on the basis of end user (including military and law enforcement) through the period of 2016 to 2021, considering 2015 as the base year. Increasing defense expenditure of emerging economies, such as China, India, South Korea, and Turkey, among others, is expected to offer several growth opportunities to the stakeholders of the market during the forecast period. This, combined with the increase in research and development of the riot control systems, is estimated to propel the growth of the riot control system market during the forecast period. However, there are several environmental and governmental regulations on the use or discharge of riot control systems, primarily to reduce casualties and minimize its adverse effects on the environment. Market size estimations for various segments and subsegments were arrived at through extensive secondary research, corroboration with primaries, and further market triangulation with the help of statistical techniques using econometric tools. All percentage shares, splits, and breakdowns were determined using secondary sources and verified through primary sources. All possible parameters that affect the market covered in this research study have been accounted for, viewed in extensive detail, verified through primary research, and analyzed to get the final quantitative and qualitative data. This data is consolidated, and added with detailed inputs and analysis from MarketsandMarkets, and presented in this report. 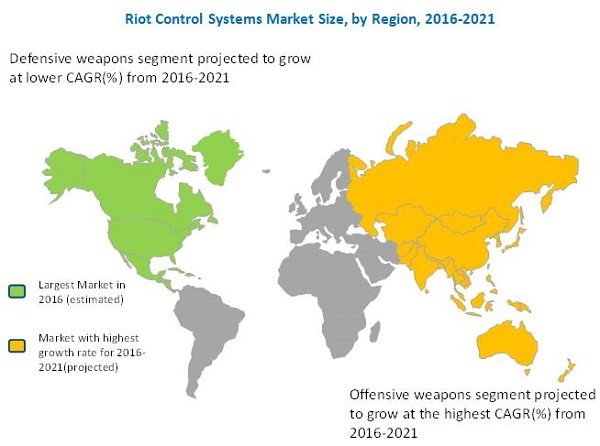 The ecosystem of the riot control system market comprises raw material suppliers, manufacturers, distributors, and end users. The key end users in the market are law enforcement and military sectors. Some of the key players in the riot control system market include Taser International Manufacturing Company (U.S.), Combined Systems Inc. (U.S.), and The SAFARILAND Group (U.S.). These players are adopting strategies, such as new product developments, long-term contracts, and business expansion to strengthen their positions in the global riot control system market.